With the new kitchen garden bed finally completed this year in March, tarragon was one of the first herbs planted. 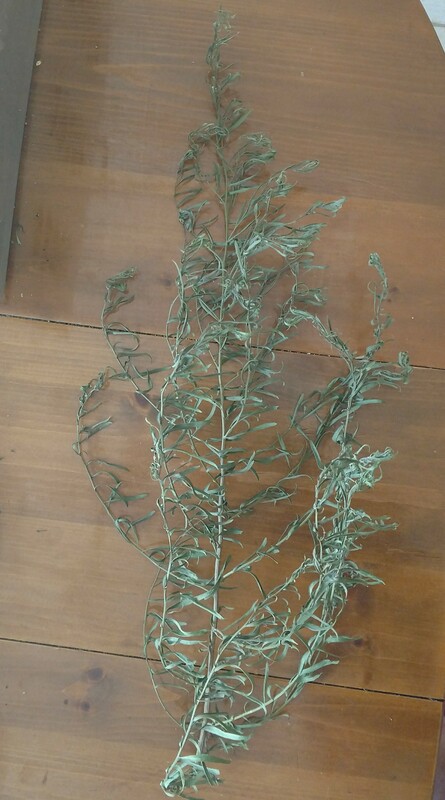 This Tarragon plant is about 20 inches from base to tip, and includes a number of branches. We started the plants with seed. Germination was quick (about 4 days) but growth was initially slow. As the temperatures increased over time, the tarragon grew more quickly. From germination to harvest for this particular Tarragon plant was about 20 weeks. I have been harvesting the plants when they were about 6 to 8 inches tall, then drying them in the dehydrator, and packaging in glass canning jars. This plant was air dried in the house, and it was completely dry in about 4 or 5 days. Once dry, the leaves are easily stripped from the branches by running two fingers (thumb and index finger) from top to bottom of the stem. The leaves are left whole when packaged, and then broken into pieces when used in cooking. By keeping the dried leaves whole, the nutrients and flavor remain stronger and are released when the leaves are broken apart. As with all of my kitchen garden herbs and veggies, I buy non-GMO seeds and do not used chemicals (compost for fertilizer, with added epsom salt as a source for magnesium for tomatoes). The flavor of the fresh is great, and the flavor of the dried is better than the tarragon that is commercially packaged and sold. ← Popping Corn about Ready for Harvest!